Now that I have some time to catch up on my blog (i.e. 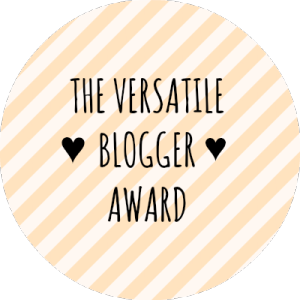 no more wedding planning), I can finally respond to this awesome nomination for The Versatile Blogger Award. I was nominated (back in February) by Emma from The Book Brief. Thank you so much Emma! 1. I recently got married on April 25, 2015 to an amazing man! 2. I sometimes have an unfortunate case of not wanting to exercise because I’d rather be writing or reading. Can anyone relate? 3. I love buttery Chardonnay wine. Yum! 4. I’m obsessed with taking pictures. They are a way for me to relive great memories. 5. When I download a new song I listen to it over and over again until I get tired of it. 6. I have to read a book all the way through even if I’m hating it. 7. I recently found out that I can sleep on planes if I take a Jet Blue flight because they have a lot more leg room compared to other airlines and (according to my husband) I have giraffe legs that need room to stretch out. At this point I will not be nominating anyone as there are too many great blogs to choose from. ← My Life Update #8 | I’m Married! !